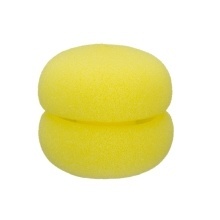 These Sponge Hair Curlers is high elasticity and protective, never make any damage to your hair. You can go to sleep with them, no pains at all and much healthier. Gives you natural, flowing waves. Portable design and convenient to all people, easy and simple to use. Curls hair without heat, much healthier, gives you natural, flowing waves. Time-saving design, the balls are super soft, you can go to sleep with them, no pains at all. Reusable, and easy to store. When hair is about 80 to 90% dry after washing, curl with the sponge curlers and go to sleep,Wake up with natural looking curls the next day.